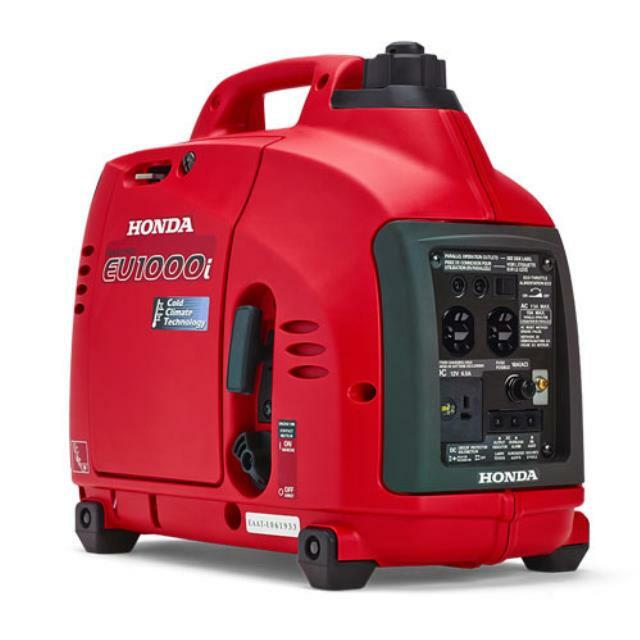 This super quiet generator is extremely portable as well as fuel efficient, running up to 8.3 hours on a single tank of gas when used with the Eco-Throttle feature. This easy starting generator produces only 50 decibels of sound running at full load, which is less than common speech. This generator is ideally suited for use with sensitive electronics (e.g., computer, printer, and other sensitive electronic equipment) because the generator produces a clean sine wave of energy that prevents surging. The unit also has a DC terminal for use when charging 12-volt automotive type batteries. The available power is commonly used for the following typical electric devices: fans, TVs, radios, small power tools (like a 1/4" drill), and small kitchen appliances. Click here for the Honda EU1000i operator's manual.